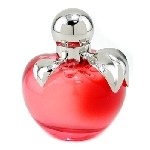 Nina by Nina Ricci is the essence of a woman who is tailored by day, brilliant by night. Evokes the freshness of a moment, the intrigue of a night under the stars; envelops with memorable intensity. Every time I wear this product I receive constant positive comments about the fragrance. This is my go to perfume, perfect for spring, summer and fall. It doesn't get any better than Nina by Nina Ricci!!! I was in a store like 6 years ago and i saw this cute little apple thing and i was like "hmm that must smell crazy good". so i got the perfume counter girl to give me a sample and i LOVEDDD it!! SO GOOD. so a year later my mom bought it for me and i haven't stopped wearing it ever since. i get so many compliments on it. It's crazy:D its like totally my signature fragrance. Not as overpowering as a a lot of fragrances, but definately is noticable. I came across this fragrance in a sale booklet that had samples that you rub on your wrist. I fell in love with the scent.